The SHINKAI 6500 will visit extreme deep-sea environments and reveal the habitable limits of life and its unique survival strategies. On January 5, 2013, the R/V YOKOSUKA, carrying the manned research submersible SHINKAI 6500, will depart from the headquarters of the Japan Agency for Marine-Earth Science and Technology (JAMSTEC) in Yokosuka, Japan. 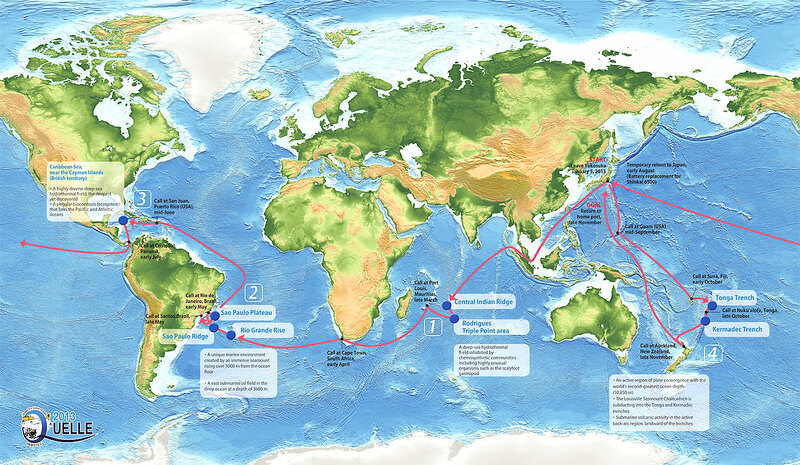 This will begin the challenge of “QUELLE 2013,” a round-the-world voyage of SHINKAI 6500, which will spend about one year visiting the Indian Ocean, the South Atlantic, the Caribbean Sea, and the South Pacific Ocean. SHINKAI 6500 will visit hydrothermal vent fields, submarine seepage sites, the ultra-hadal zone of deep sea trenches and other extreme environments, where it will shed light on the habitable limits of life and its unique survival strategies. QUELLE 2013 may even answer the question of how the Earth became a planet brimming with life. * The schedule may change due to weather and oceanic conditions. The name of this voyage, “QUELLE”, is an acronym for “Quest for the Limit of Life”. It also means “roots” or “origin” in German. Is this the first around-the-world voyage for the SHINKAI 6500? This great voyage by the SHINKAI 6500 and its support vessel YOKOSUKA is the first in 15 years, since the 1998 cruise MODE ’98 (Mid-Oceanic Ridge Diving Expedition). Taking the eastern route around the world for MODE ’98, surveys were conducted along the Mid-Atlantic Ridge after passing through the Panama Canal, and the Southwest Indian Ridge was surveyed after passing through the Suez Canal, making SHINKAI 6500 the first manned submersible to conduct a survey in the Indian Ocean. During the decade following the year 2000, scientists from over 80 nations participated in the “Census of Marine Life”, furthering our understanding of the diversity and distribution of marine organisms. Deepsea zones below 2500 m, the open ocean away from land, and especially the greater part of the southern hemisphere, however, were found to be as yet largely unexplored. That is why we are going to the southern hemisphere and the deep sea. * Please print it out and fold it three times to make a six-fold leaflet. SHINKAI 6500 is a deep submergence vehicle that can dive to depths of 6500 meters. It carries one researcher and two pilots. SHINKAI 6500 was completed in 1989, and since its first research dive in 1991 has conducted surveys around Japan as well as throughout the Pacific Ocean, and in the Atlantic and Indian Oceans. The support ship YOKOSUKA performs surveys of the deepsea floor by acting as a support ship for the SHINKAI 6500.